*it’s great with Satsuma Mandarin Orange Balsamic Vinegar, too! Combine Five Spice powder with salt and season chicken pieces. Heat a wok or skillet over medium high heat. Add olive oil and then chicken pieces. Stir fry until golden brown. In the meantime combine sesame oil, soy sauce, balsamic vinegar, hot sauce, and honey. Whisk to combine. Set aside. 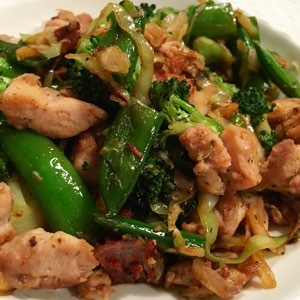 When chicken is golden brown and cooked through remove from pan and add broccoli and snap peas. Towards the end add cabbage and cook to desired doneness (I like my vegetables crispy). Add chicken back into pan, and pour sauce over all. Continue to stir fry until sauce slightly thickens and coats everything in the pan. Serve with rice or delicious on it’s own.